Okay, I've posted this article in its French version a while ago but I've been a bit busy (or lazy for that matter) and some articles have been piling up waiting to be translated. So here is the first part of my winter sales haul, I am really happy with everything that I have bought and here are the clothes in a lookbook that I'm not starring in hehe ! Okay, I've definitely not taken the time to iron the clothes : they are crumpable so I didn't want to iron them when they would get crumpled just a few moments after. Hope you understand ! 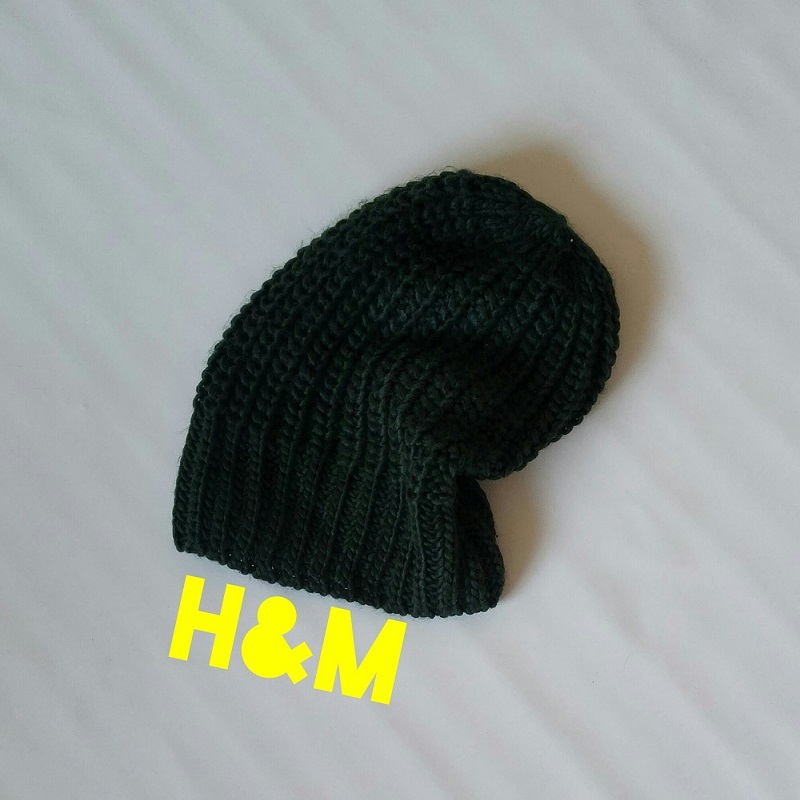 This hat is the last piece of clothing I've bought : an oversize H&M bottle green hat. From the beginning of the sales it went from €7.99 to €5 then €3 and €1 which was when I bought it ! I love oversized hats, I wear them all the time ! You know how you need to get up early on the first day of the sales to get some affordable and nice clothes. Well I've been to some stores during the first day and I've bought some nice things ! For instance, this nice crochet boho-type tunic. I already have some of the like and I love how the back is longer and covers the bottom easily. The shoes are chelsea boots I've bought at André for €29.50. I have actually been wanting the brown version for a long time but they only had my size in black so I went for these ones ! This tunic I have bought for €10. That's a long striped shirt with a tiny belt, and it's quite large so I guess I'll be wearing that with slim pants or a legging so I don't look overly fat ! I've bought the fake Doc Martens at André too because when I when back there they had this huge -60% sale because the store is closing down. I've paid €23.60 for these and I love them ! There has actually been a real Doc Martens liberty-pattern pair of shoes in my wishlist for more than a year now so I am glad I found these ! 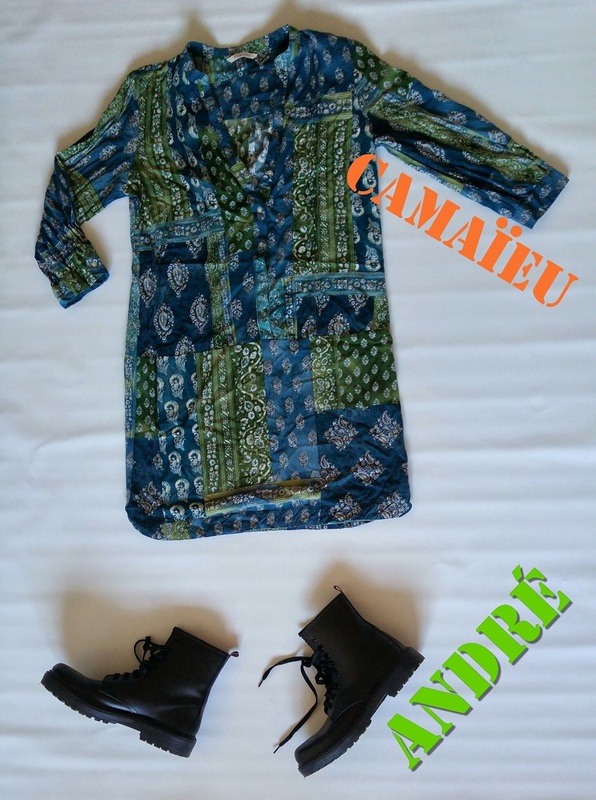 This is the first tunic I've bought at Camaïeu for €20. Camaïeu always releases the same kind of tunics and they're knee-length so that's pretty useful for a hijabi ! The shoes are the same fake Doc Martens from André. 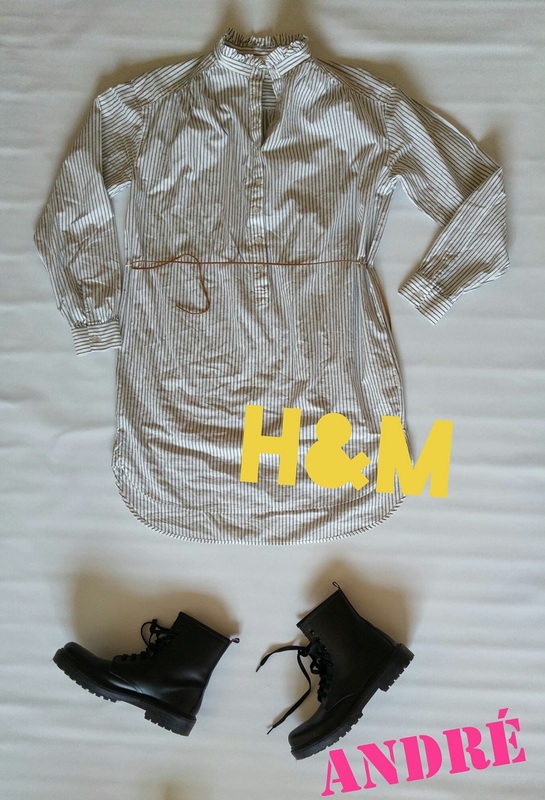 I have bought this H&M tunic for €10 or €15 and that is my favorite look of all ! It's really interesting, I guess you love it or you hate it. It's white, navy blue and brownish and has a small belt. The pattern is made of flowers but I like to see fireworks ! What look is your favorite ?